Avocados and tomatoes pair perfectly with the taste of garlic and onion. This recipe makes use of this great combination with fresh ingredients and the strong flavors of our Pastamore Garlic with Toasted Onion Fettuccine. 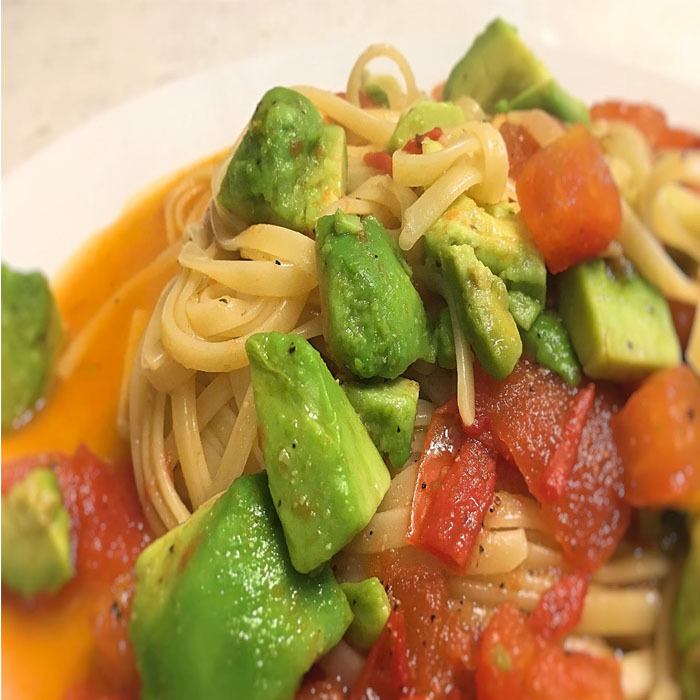 This dish is spiced up with our Pastamore Kettle Roasted Jalapeno Oil which can be substituted with red pepper flakes if your bottle is empty. 2. Heat a large pot of water over high heat. Bring to a boil. Once boiling, add Pastamore Garlic with Toasted Onion Fettuccine. 3. Heat a large pan on the stove over medium heat. Once hot, add the Pastamore Kettle Roasted Jalapeno Oil and tomato. Cook until tomatoes are tender, stirring often. 4. Cook pasta until al dente. Drain using a colander keeping 1/2 cup of the pasta water. Combine the pasta with water and tomatoes into one pot. Mix well and season to taste with salt and black pepper. Add avocado and mix.